The Wizards just had their best week of the season, going 3-1 and seeing PG John Wall receive the NBA’s Player of the Week award. Their reward? Four games in five nights with travel between each of the games. Yikes! 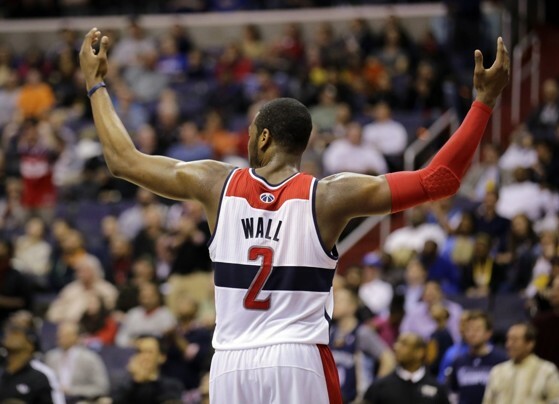 The uptick in Wall’s production was as welcome as it was abrupt. His shooting had been atrocious, but became deadly, and he continued doing a first-rate job of finding teammates for open shots at the basket. His play was similar in quality to his transcendent March — when he performed like one of the game’s top five players. In other good news for the team, Wall wasn’t the only player who improved. Martell Webster enjoyed his return to the starting lineup, and Marcin Gortat and Nene also seemed to settle into their roles. Bradley Beal boosted his production a bit as well, though the youngster still has a ways to go. The upcoming week will be a challenge for the depth-starved Wizards. They have the makings for a solid top seven, but everything after that remains a major question mark. Here’s the weekly Player Production Average (PPA) update. PPA is a player rating stat I put together that credits players for things they do that contribute to winning and debits them for things that hurt the cause (each in regression-analyzed proper proportion). PPA includes defense, is pace-adjusted, and incorporates a “degree of difficulty” factor based on the strength of the opposing lineup. In PPA, 100 = average, higher is better, and replacement level is 45. As Captain Obvious said, “The bench remains a major weakness.” Jan Vesely’s effectiveness declined as his playing time increased. Trevor Booker’s individual numbers are good, but the defense is a catastrophic failure thus far when he’s on the floor. Al Harrington was awful before he sat with knee trouble. Kevin Seraphin has been even worse than last season — and last season he was the league’s least productive center. Guard depth is scary as well. Eric Maynor is drawing ire for his crummy play, but what he’s doing is exactly what fans should have expected from him. His PPA this season: 50. His career PPA before this season: 49. His peak PPA for a season was 57. This is his normal level of play. What’s scary: Temple has been worse. For now, I don’t envy the options head coach Randy Wittman has. The team desperately needs at least two someones from the bench to step up production — one big and one guard. Unfortunately, the roster assembled by Ernie Grunfeld isn’t jammed with “good bets” on a guy or two who might suddenly start playing better. I’ve been suggesting since offseason that the team’s best option for depth may be to use SF Trevor Ariza at PF (as a stretch four), especially if injured rookie Otto Porter can give them productive minutes at SF. Ariza is likely to be more productive as an S4 than Harrington has been, and he may provide the opposition with challenging match-ups at that spot. No matter how I look at the various lineup permutations, the team’s rotation is skimpy — at best. With reasonable health for its rotation, the Wizards should be a playoff team. Lose anyone from the top seven or eight, and the playoffs are dicier, even in the East. And, I don’t think can sustain an extended absence from Wall, Nene or Gortat, however. They won three of those four!